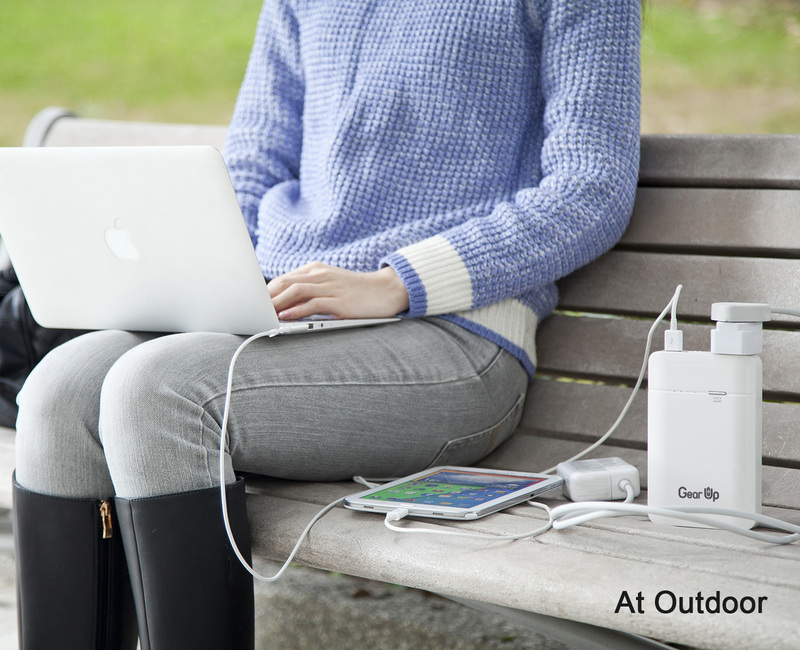 Powered by AC Power Everywhere You Go! Sitting still with nothing to do will no longer happen again when your laptop, tablet or mobile phone run out of battery. Now you just need to take out the AC power from your bag to continue your journey. 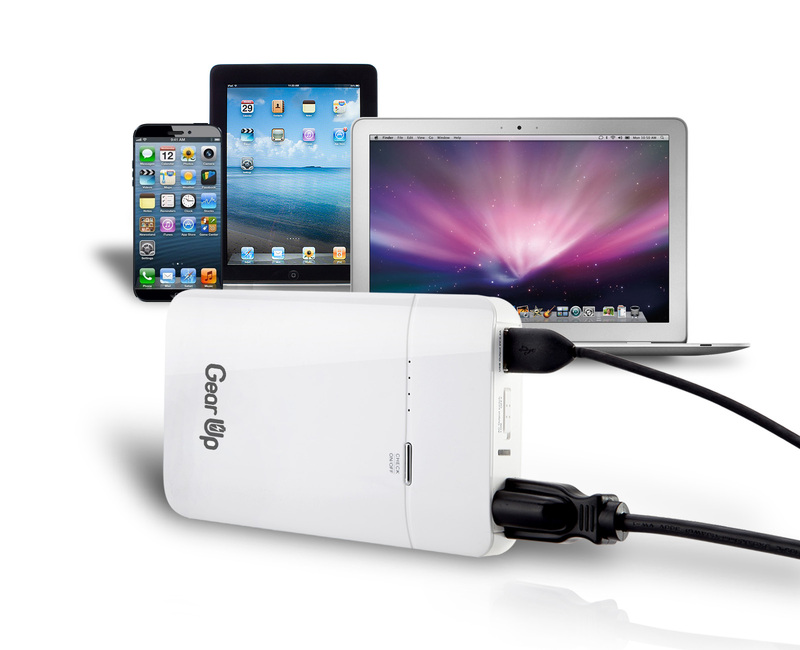 With Gear Up AC Power Bank, you have AC POWER when you are on the road, on sailing or even in the airplane. 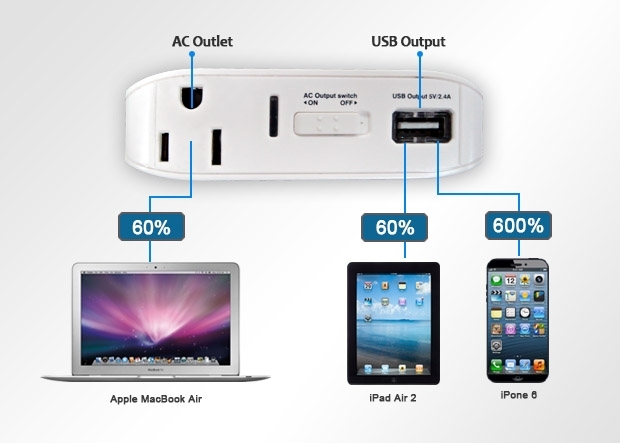 You no longer need to seek for a seat which is next to a wall outlet in a coffee shop, restaurant and airport lounge. 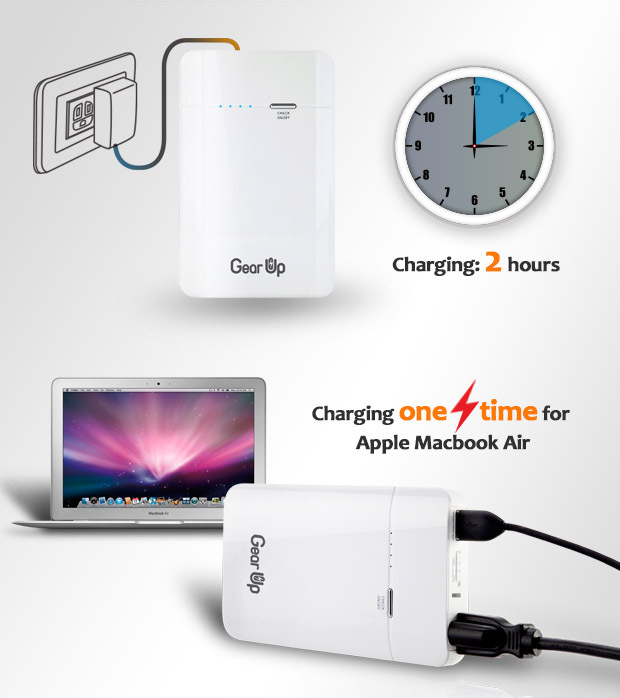 Gear Up Power Bank charges all your favorite electric devices such as Tablet, Apple MacBook & iPad, Samsung Phone. This AC PowerBank is much easier to carry than a bulky power supply and outdoor generators. 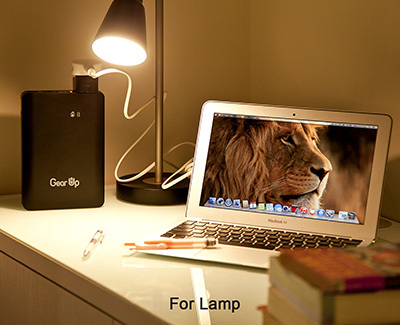 It can even charge your home appliance under 65W like a fan, table lamp, radio and TV. Gear Up AC Power Bank uses a premium battery material that is qualified in charging Tesla electric car. 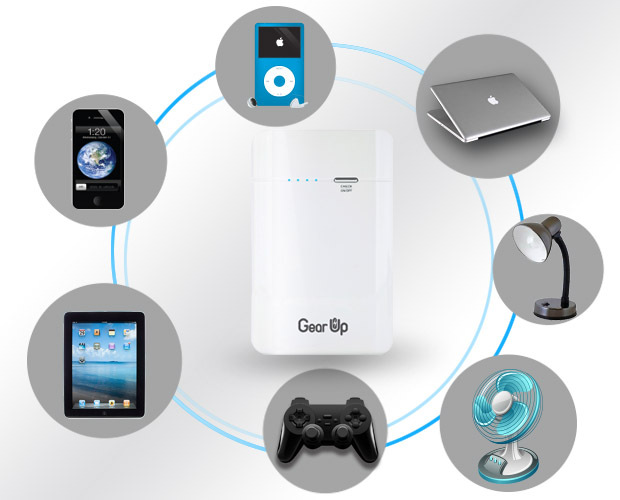 It can charge up any AC power devices up to 65W for 13,000mAh and 85W for 20,000mAh. At the same time, you can enjoy DC power for 12V devices. Sleep Tight, No Worry For Blackout In Darkness Anymore! 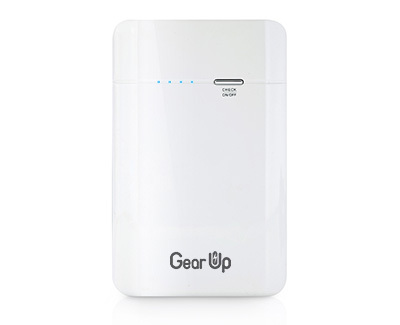 Gear Up AC Power Bank is an ideal backup power solution to replace huge and heavy power supply and outdoor generators for low power consumption devices under 65W (13,000mAh) or 85W (20,000mAh). 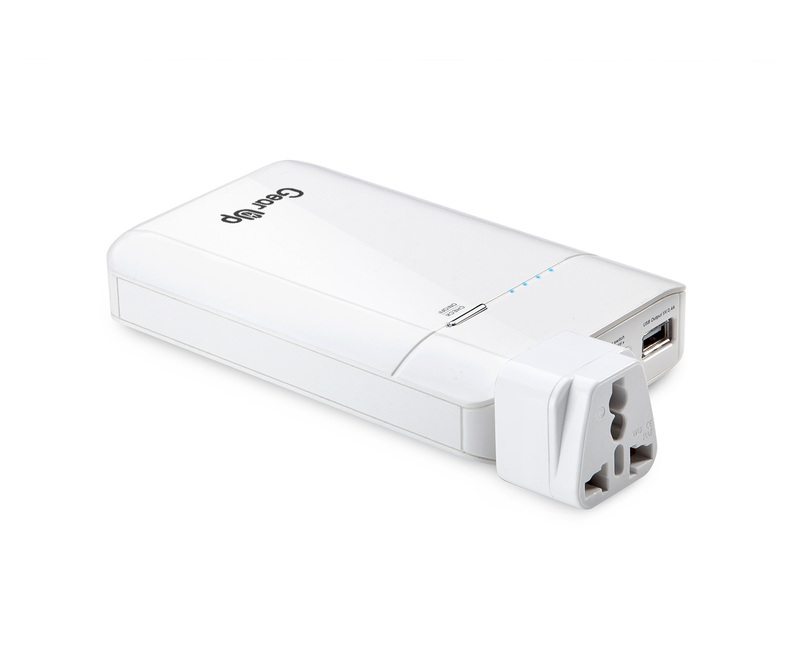 HISdigital has this younger brother Gear Up 13000mAh Portable AC Power Bank (the “Power Bank”) to the bigger 20000mAh Power Bank. It is designed for a continuous AC output power of 55W and a peak AC output power of 65W. My HP Envy 15.6” notebook’s power adaptor output is 19.5v x 3.33A or 65W. To test the product, I started charging my HP when its battery was at 67%. It climbed up 10% to 77% after 14 minutes while I was continuously using the computer. I then shut down the computer and let it charge for 12 minutes. My HP battery reached 87%, or a 10% gain for merely 12 minutes of charging. It still has >25% power left after these charges - an indication that my notebook computer is continuously drawing more power from the 55W power bank. Other power banks provide different tip sizes to charge the computer directly. But there is no guarantee one of those tips is the right tip - which I found out painfully with my HP Envy 15. It is definitely a no go for a gadget that requires direct AC inputs. 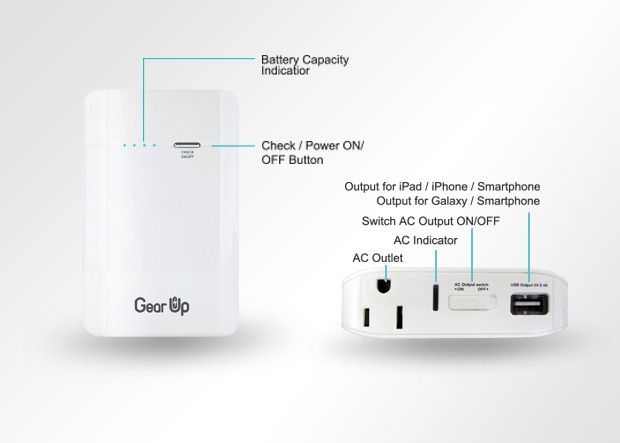 The clever design of providing the AC outlet allows the user to plug in his/her power adaptor which solves all these unknown issues. It charges my notebook PC and it lights a 15W CFL lamp for 2.5hrs. The AC outlet is like any wall AC outlet. Away from this environment, you can plug a lamp to light up the camp, boat, or any imaginable rescue scenario. Just imagine a beacon of light which lasts hours and hours if you’re under the snow or stranded in the mountains. The implication could mean life or death by having or not having this Power Bank. 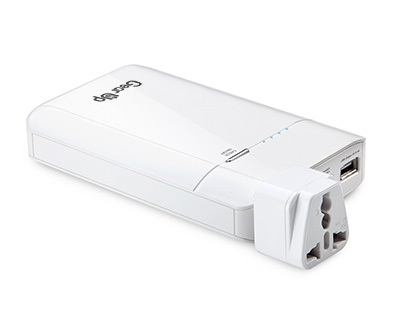 Dramatics aside, unlike other products requiring 2 different types of USB ports for cell phones and other devices, this Power Bank has 2 USB ports which regulate the power output automatically. This feature alone can save your expensive phone if you are not sure which USB port to plug in for re-charging. 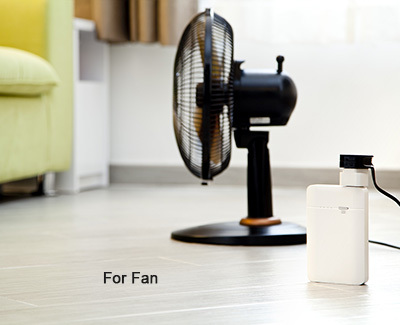 •	Charging timer and temperature protection. 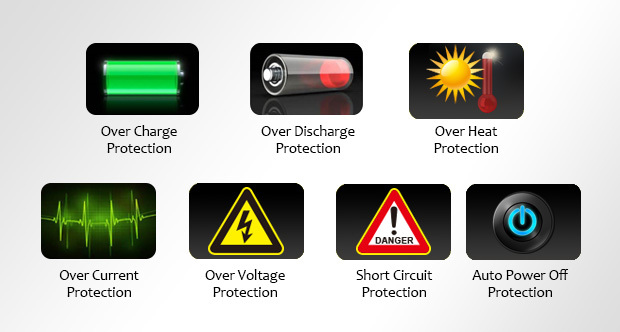 As described in HISdigital’s in-depth product information page http://www.hisdigital.com/ca/product2-871.shtml, this Power Bank uses a premium battery material that is qualified in charging Tesla auto-pilot electric car. Besides the quality internal components, the solid pure white casing is simply elegant. It is sized like a pocketbook and weighs 400g. It is fully charged with all 4 indicator lights on with just an hour. This is a Power Bank to behold. January 2th, 2015 at 08:05 pm By Niclas R.
Amazing product! To be able to get an AC power out from something this small feels almost unreal. It even fits in your jacket pocket. Perfect product if you travel a lot and need to charge your notebook, tablet or cellphone, especially on airplanes where you rarely find AC outlets at your seat. From now on I will never miss another ending of a movie when I’m travelling due to battery loss in my tablet.